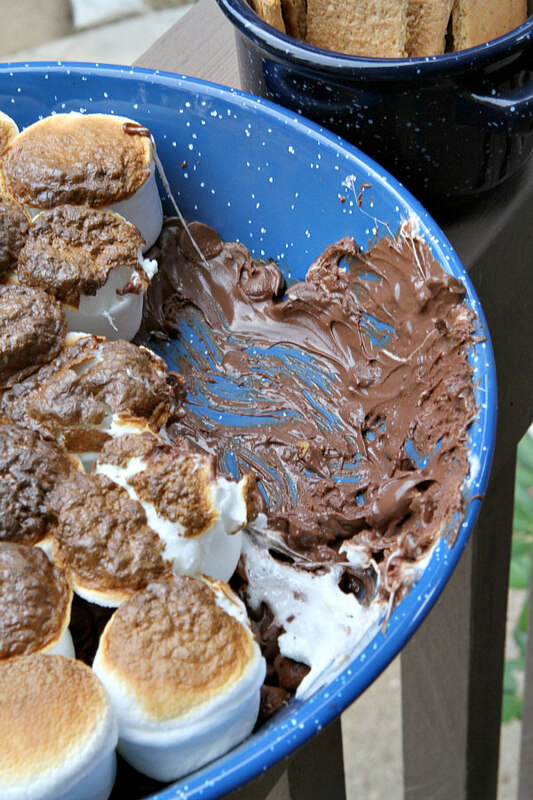 Here’s a super easy S’Mores Dip for you to make in the oven! Watch the video showing you how to make S’Mores Dip, then scroll to the bottom of this post and print out the recipe so you can make these at home! I’ve been very busy with lacrosse-related things and the beginning of high school. My classes are hard! High school hit me like a freight train. I have been slammed with homework ever since the second day. I am also in the middle of varsity tennis, which is going very well. I can’t wait for my travel lacrosse team to start back up too! This year we are going to a lot more tournaments than usual. That’s what has been happening with me lately, and now you have to find out what is happening with this S’Mores Dip! 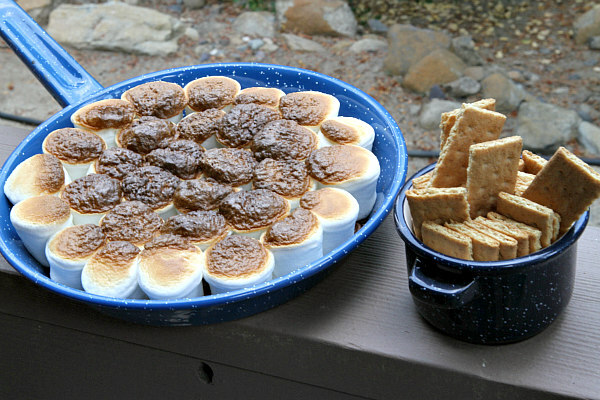 This S’Mores Dip originated from somewhere online. I saw it and knew that I HAD to make it! It is literally the simplest recipe in the entire world (and one of the best tasting). It is a three step process to make this S’Mores Dip. 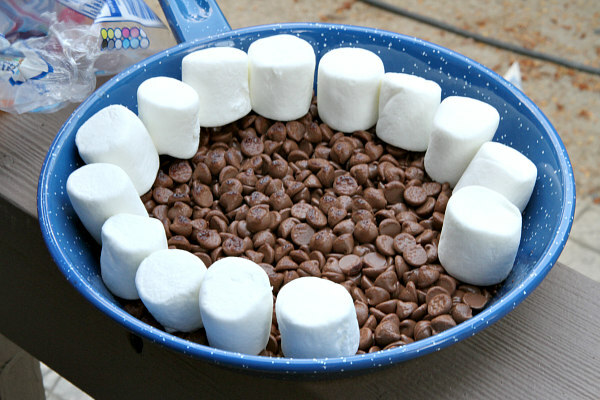 You simply pour chocolate chips in a pre-heated skillet, place marshmallows all over the top, and stick it in the oven. When you take it out, the dip should be nice and gooey. 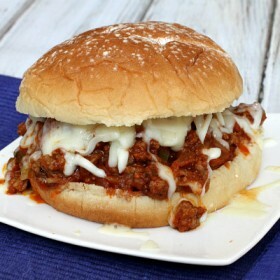 This is what I am talking about when I say gooey! You grab a graham cracker and scoop up some s’mores goodness. The melted chocolate definitely pegs this recipe a notch above traditional s’mores. 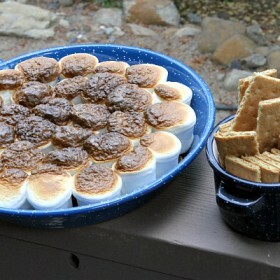 Instead of having to make one s’more at a time, you can now make one big pan of s’mores for a crowd! The ease and simplicity of this recipe make it a must for all s’mores fans. Melted chocolate galore! This recipe is very rich and tasty. 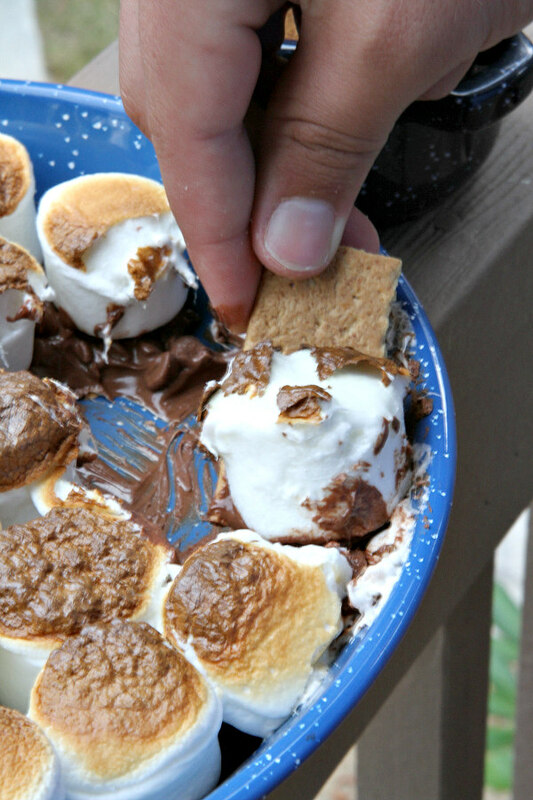 All you have to do is take a graham cracker and dip it in the chocolate and marshmallow. Anyone can make this recipe. Have fun! The easiest, most delicious dessert dip ever! Preheat your oven to 450 degrees F. Make sure you have a rack in the center of your oven. 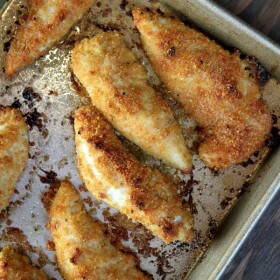 Put an oven-safe skillet (like a cast iron or similar) into the oven to heat along with the oven. You can use another kind of dish if you like, but a heavy skillet works best. Use oven mitts to remove the hot skillet from the oven. Place the chocolate chips in an even layer in the hot skillet. Put marshmallows on top of the chips. Place the pan back into the oven. Heat for 5 to 7 minutes (keep the oven light on so you can keep a close eye). You want to take it out when the marshmallows start to get really toasty looking. Remove from the oven and dig in with some graham crackers. Looks yummy. My favorite recipe adds a bit of heavy cream to the chips to make a short of ganache. Creamy and delicious. Keep cooking you are doing great! If you were to make this and not finish it all, how would you store it and would you be able to later hear it up? I don’t think that’s a good idea. Best to make it and eat it all at the same time!